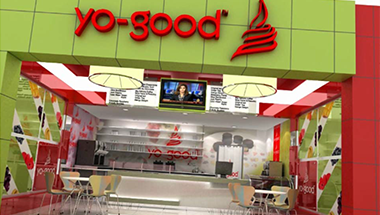 Yo-Good is one of the better choices for a frozen yogurt business that combine wholesome non-fat yogurt with a variety of healthy crepes, waffles, or even smoothies. Yo-Good is made with non-fat yogurt with no artificial sweeteners. 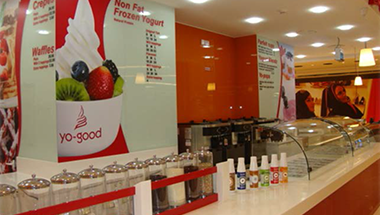 Our delicious flavor comes from the natural goodness of fruits and berries arrayed in the toppings bar. 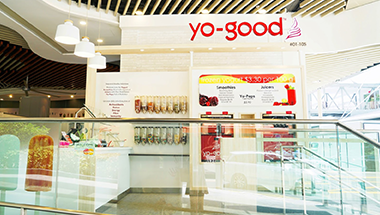 Customers can choose their own combinations and explore new flavor sensations during every visit they make to Yo-Good. For 100-300 sq. ft. or 10 to 30 square meter spaces. model, and requires no seating. It’s suitable for areas with limited space and very high foot traffic like malls, airports or other transportation hubs. It requires low investment, and is suitable for co-branding with other foods and retail. Kiosks are installed in strategic locations to draw maximum customers. For 300-500 sq. ft. Bars are suitable for areas with high foot traffic like mall food courts or street fronts. The seating capacity may be limited or shared with other restaurants. Kiosks are installed in strategic locations to draw maximum customers. The lounge concept is designed to offer a full menu with ample seating. It is suitable for posh up-market localities and shopping districts. A lounge can be a trendy meeting place at street fronts or malls. Adding wireless internet access can significantly boost the desirability of your lounge.